Senna, a moving biography of the late Formula One driving star Ayrton Senna, is a stunning exercise in cinematic immersion. There is no primer on F1 racing and its massive popularity in the rest of the world (besides soccer, no other sport surpasses it). Montages seem to be regarded as redundancies. The film completely eschews talking heads. It's more of an audiovisual scrapbook than a conventional interviews-and-infographics documentary. This makes for some bumpy first impressions, but it pays off in spades by the end of the film. Senna builds its momentum by ignoring convention and still manages to deliver a timeless story about the making of a legend, feeding off the rambunctious energy and passion of its subject. 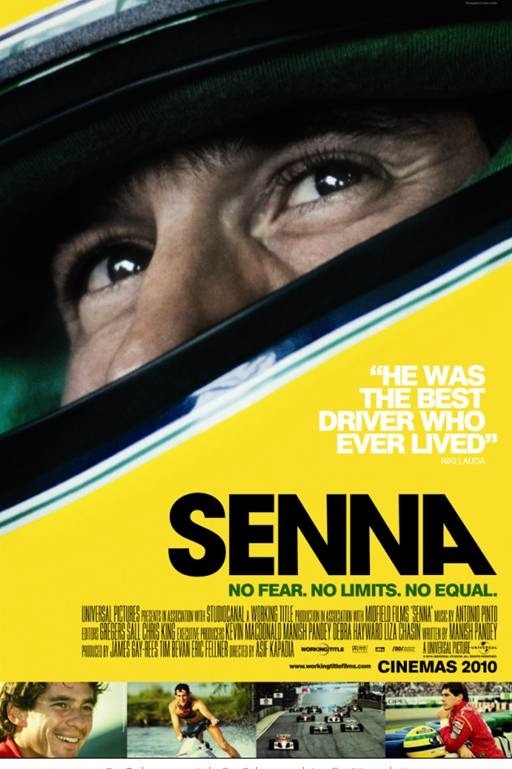 Though the Brazilian driver's career was relatively brief, director Asif Kapadia doesn't lack for great material, skillfully juxtaposing Senna the phenomenon with Senna the man. Here was an athlete whose genius was as daring as it was reckless, though not without a sense of mortality (auto racing is, after all, one of only three pursuits that Hemingway lauded as "real" sports due to the participants' constant proximity to death). A devout Catholic, Senna frequently invokes the divine to describe the sublime joy and fear of whipping a kayak on wheels around hairpin turns at 150 miles per hour. The first half of the film details how this approach soured his relationship with some of F1's biggest power brokers, including champion driver Alain Prost - who, as it happened, would become Senna's teammate for two tumultuous seasons in the late 1980s. The Prost-Senna rivalry is but the incubator of an eventful career peppered with incidents that carry more than a whiff of conspiracy, illuminated by some incredibly damning footage. In one breathtaking pre-race sequence, Senna leads his jumpsuited colleagues in lobbying his other great professional nemesis, former F1 president Jean-Marie Balestre, in making changes to improve the safety of a German grand prix course. The look of satisfaction on Senna's face reveals so much. No secondhand account of this story could ever match watching the drama unfold in real time. Some eyebrows might rise at the whitewashing of Senna's mercenary tendency to jump to whichever team occupied F1's financial and technological apex, especially when the film goes to lengths establishing Senna as the antithesis of the less-skilled driver made great by his team owner's deep pockets. Kapadia also engages in clunky hero-worship here and there, but it's discomfiting inasmuch as it is completely unnecessary. There's plenty in the film already that would support Senna as a highly sympathetic figure. But then Senna is something of a legacy project that remembers the great sportsman as something more a bright light that burned out all too quickly. It's only fair. People seemed to dislike Senna simply because he refused to give anything less than his best, even as he blew away his competition. Senna does him a great service by boldly stating its case to join the rarefied company of the best sports documentaries ever made.